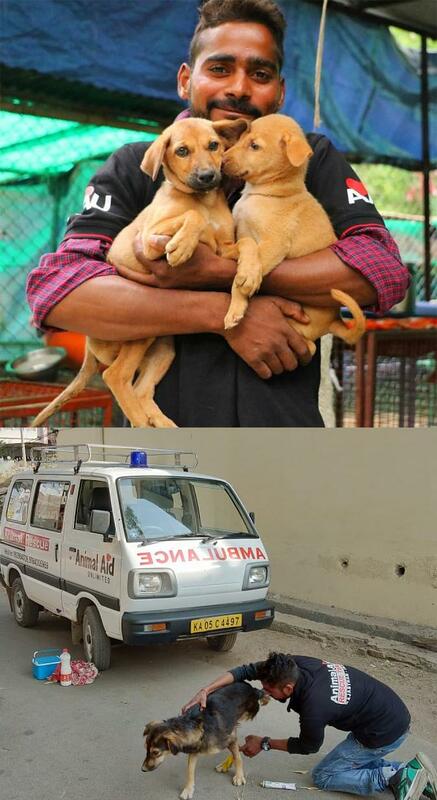 India: December Greats From ‘Animal Aid Unlimited’. Please give anything you can to support this wonderful organisation. WAV. We got a call that a terribly injured street dog was hiding in a construction site. A horrific wound had made a hole clear down to his skull and the tissue was consumed by maggots. We weren’t sure we could save him, and with each minute his chances for survival dimmed. Thanks to donations from supporters, watch the beauty restored by weeks of treatment and love that helped this brave boy win his fight for life. Please donate because someone precious needs you now. Treating dogs right on the street takes many special skills–to be able to gain a dog’s trust almost immediately; and when examining, giving medicine or dressing a wound, to be so incredibly gentle that the dog will allow you to treat him again tomorrow and the next day. Pushkar Gameti, 26, tracks about 15 different medical cases every day on the streets of Udaipur. Since 2013 he has performed almost every task in the hospital. Because of Pushkar’s talent, hundreds of dogs have been able to get well without any hospital stay at all, or to complete the final laps of their treatment back in their own neighborhoods where they are comforted by the people and animals they’ve grown up around. Every dog we can heal on the street means there is room for one more dog IN the hospital who couldn’t survive on the street. Pushkar, we thank you for your outstanding work that has saved so many precious lives. We got a call on our helpline to rescue an injured bull. We found him emaciated and his face was disfigured from maggot infested wounds around his eyes. A rope was tied through his nose so tight it had started to rip the skin. Because he was tied, we knew he must have been owned and had been abandoned to die without treatment or care in the field, unable to even see because of the massive wounds on his eyes. We brought him back to our hospital and began his extensive treatment which included daily wound care and bandaging, antibiotics, painkillers, lots of food and a safe place to rest and heal. We soon found that this sweet bull, who we named Yoda, just wanted love and was gentle throughout every treatment, despite the pain he was in. We deeply thank you for your support which has saved this dear boy’s life. Please donate today for animals in India desperate for help. Sponsoring a Sweetheart makes a Cherished Christmas gift! When you sponsor an animal you’ll be sent a beautiful certificate with his or her photo, your name (or the name of a person you’re gifting it to) and a special thank you from Animal Aid. You’ll receive the emailed certificate within 3 days–time enough to get it framed and present it as a gorgeous gift of love. Click here to make your sponsorship today! England: Viva ! – December Vegan Food and Recipes. Victory of the little ones against the big ones!